KOCHI: “Every day we are out there in the open sea, braving the elements, to eke out a living. It is a struggle for livelihood. Sometimes the sea will be rough. The rising waves will crash on the decks of the boat, tossing and swaying it all around. We cast the net hoping for a good catch. Sometimes we have to return empty-handed. Now our biggest fear is the ships. They are silent killers. There is no value for our lives. If we return to the shore safely, it is by God’s grace,” said Joy, a fisherman, struggling to hold back tears. 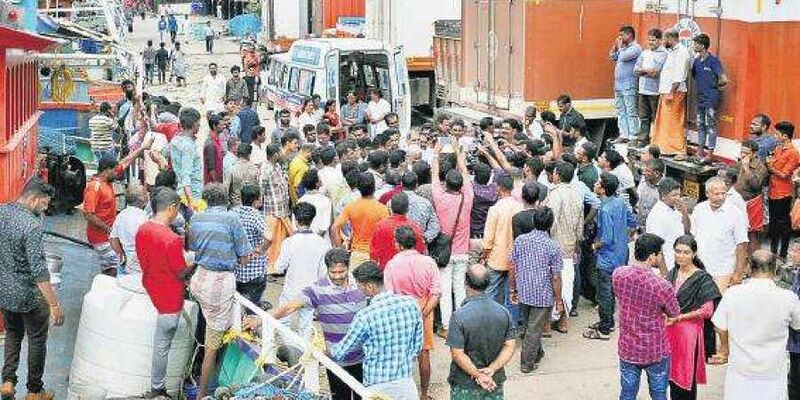 A pall of gloom descended on Munambam Harbour, one of the busy fishing harbours in Kochi, as the news of the midsea collision which claimed three lives broke on Tuesday morning. As many as nine workers are still missing and the fishing boats and vessels of the Navy and the Coast Guard are scouring the sea to find them. There has been a spurt in midsea collisions recently which has cast a shadow of gloom over the coastal areas. There are around 400 fishing boats operating from Munambam Harbour. Most of the boats set off for the sea around 9 pm in the night and return next day. There are boats that go for a week-long fishing expedition also. Each boat will have 15 workers and only one or two among them will be Keralites. Most of the workers hail from Kanyakumari district in Tamil Nadu while the rest are from West Bengal and Assam. Kochi has been the main fishing hub of Kerala with trawl boats, long liners, gill net boats and traditional boats operating from various fishing harbours. While Thopumpady, Munambam and Murukkumpadam are the harbours for trawl boats, traditional boats operate from Kalamukku and Chellanam. “Around 1,000 trawl boats and 5,000 traditional boats operate from Kochi. The sector brings revenue to the tune of Rs 52,431 crore and provides jobs to thousands. The government has the responsibility to ensure the safety of fishermen at sea,” said Matsya Thozhilali Aikya Vedi president Charles George.